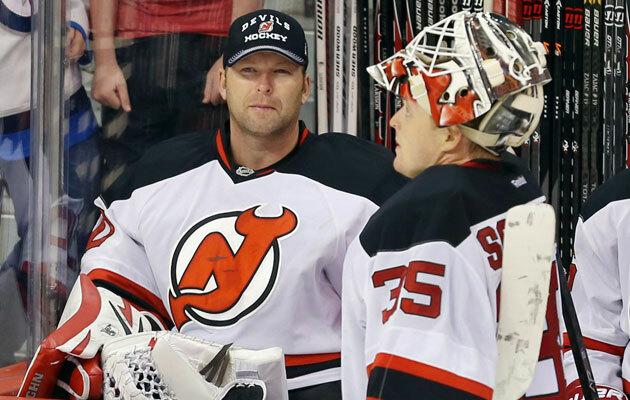 Is the Legend of Martin Brodeur at it’s end? Last season, when New Jersey Devils’ goaltender Cory Schneider was still a member of the Vancouver Canucks, he was constantly in the shadow of Roberto Luongo, waiting for his chance to earn the starting job he deserves. Trade rumors were constantly swirling around him and Luongo, and it obviously became a black cloud looming over both of them. Draft day, June 30, 2013, in Newark rolled around, and commish Gary Bettman got up to the podium before the Devils’ pick, 9th overall, among a sea of boos. He said to the fans at the draft, “You’ll want to hear this”, grinning ear to ear, before announcing to everyone the trade that would shock the hockey world. Vancouver would be selecting 9th overall instead of New Jersey, and Cory Schneider became a Devil. Of course, the Devils have a starting goalie in their system, some guy from Montreal named Martin Brodeur, all time leader in wins, shutouts, games played…we can’t list everything he’s done, but he’s had a good career, trust me. Marty will turn 42 on May 6th. Cory is 28 in March. The fact is, Marty is toward the end of his legendary career. Despite putting up good numbers this year, it’s rather obvious that the Devils are in transition, out of the era of Brodeur. That’s why they traded for Schneider. They needed an heir apparent for the man they call Satan’s Wallpaper. But Marty has mentioned that he’s mentally still in it, and it’s all about whether his body holds up or not, to decide on whether this season is the last we will see him in net. He’s obviously still got it, but do the Devils really want him back? Cory has spent his entire career in this spot. He was behind/splitting with Luongo since his career went full-time NHL in 2010, and now with New Jersey, he’s splitting with Brodeur. One would think that with a goalie of his caliber, he should, and rightfully so, deserve a starting job. With next year being his contract year, a free agent in the summer of 2015, he’s due for a big pay day. The Devils hope it will be with them. But he would need to have the starting job in the bag by the time that extension rolls around. Martin Brodeur would probably retire by then, but we aren’t entirely sure. He says he can go another one as of now. But the Devils may want to move on. Besides Schneider becoming the full-time starter, there is a goalie in the AHL affiliate of the Devils (also the Devils, just in Albany) named Keith Kinkaid, and he should be ready for NHL backup status come next year. That looks like a goalie tandem for New Jersey’s future, and Martin Brodeur isn’t a part of it. Marty’s a legend in New Jersey, and will be loved forever by Devils fans, and hockey fans alike. No matter what happens this off-season, they will always have fond memories of Brodeur. But memories are for the past. The future of the Devils rests with Schneider in net. Marty’s career in New Jersey is likely over after this season, whether he wants to play or not. It’s a very tough break-up, understandably, considering Marty has been the goalie since 1994. But the future is approaching fast in New Jersey. We may not have seen the last of Brodeur after the regular season or playoffs this year. But if GM Lou Lamoriello knows what’s good for the franchise (and he usually has a good idea), it’s time for the team and Marty to move on. Marty will be around for 1 more season, I don’t think the Devils can let him leave, well, correction. I don’t think Marty wants to leave yet, his number are still good, and surprisingly he can be a number 1 goalie in some markets, Edmonton would be one, maybe even Philadelphia, and Florida. But he won’t leave the Devils, unless for some odd reason, they approach him for a trade to a team that will allow him to play more. Still don’t see that happening, but if the Oilers can trade the Great One, anything can happen in the NHL. What Masahiro Tanaka’s deal with the Yankees means for everyone.